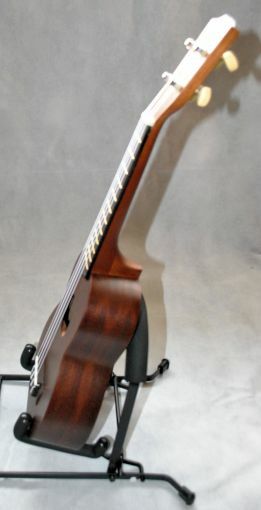 ADJUSTABLE GUITAR BRIDGE - EBONY. Location: /Instruments/Ukulele/THE CLIFFORD ESSEX POPULAR. 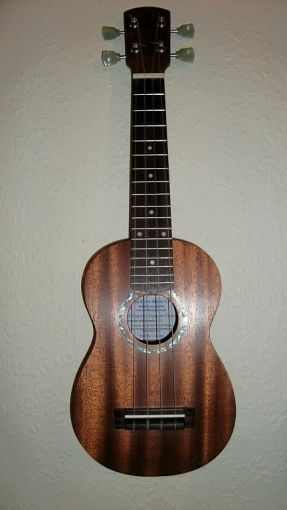 SOPRANO UKULELE WITH A FUSION DESIGNER GIG BAG. This instrument is intended for the discerning ukulele player. Perhaps you have bought your first ukulele, loved playing it, and now you want something a little bit special. If so, then the Clifford Essex Popular is for you. Solid mahogany front and back producing an amazing sound. 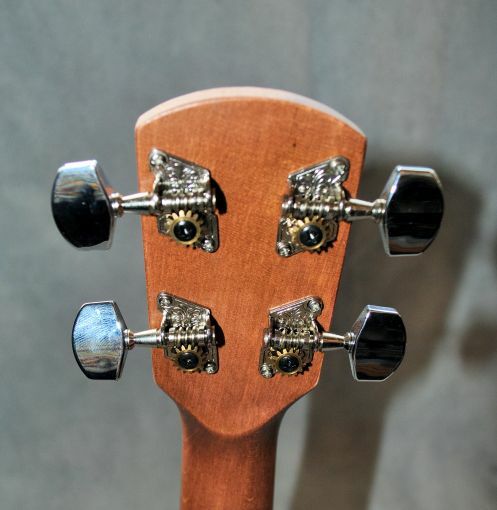 bone nut and saddle, abalone inlay, rosewood bridge. The outer material is tough polyester, for lasting good looks, while the inner lining is of nylon, with reinforced zones at the bridge and headstock where additional wear can occur. Carrying is a breeze, with twin padded adjustable back straps, plus a reinforced grab handle. Zipping is excellent, with inveted zip channels which are neat and discreet, while the large rubber zip pulls used throughout bear the fusion logo, and are chosen both for ease of use and also to help avoid scratching from metal zips. 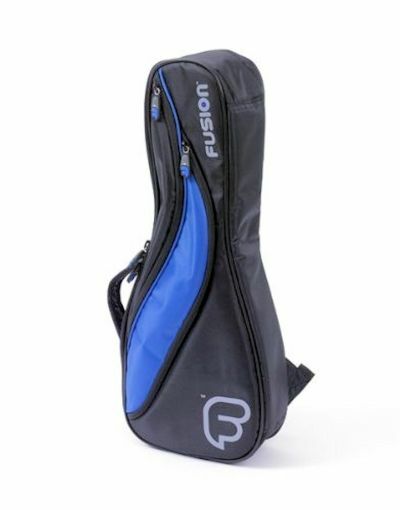 Fusion have designed in two goods sized pockets, one at the top the other, the larger of which takes up the full front of the bag. Internal Size: Length: 530mm / 20.9"
Lower bout: 200mm / 7.87"
Upper bout: 160mm / 6.3"
External Size: Length: 550mm / 21.7"
Width at widest point: 220mm / 8.66"
A bone nut and saddle adjusted to achieve a perfect action. CLIFFORD ESSEX SOPRANO UKULELE + FUSION DESIGNER GIG BAG. I am fairly new to the Ukulele but I wanted something a little bit different. I love my Clifford Essex as it looks good and sounds good too. 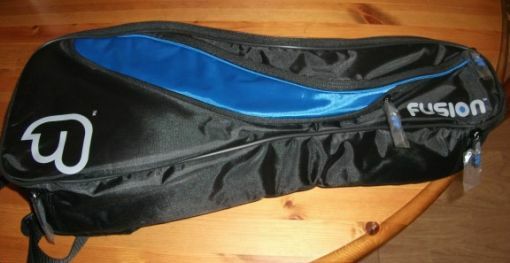 The gig bag is really good quality. Very speedy delivery too. Thankyou. At one of the recent Baildon Ukulele Club nights I was given the opportunity to play a new soprano ukulele by Clifford Essex Music Co. Ltd. Although I predominantly play a baritone ukulele I do have a soprano, in fact that’s what I played when I first joined the club, so I am fairly familiar with the instrument. Being something of a musical magpie I like to try any instrument careless owners allow me to handle, so needless to say I jumped at the opportunity to play this ukulele. 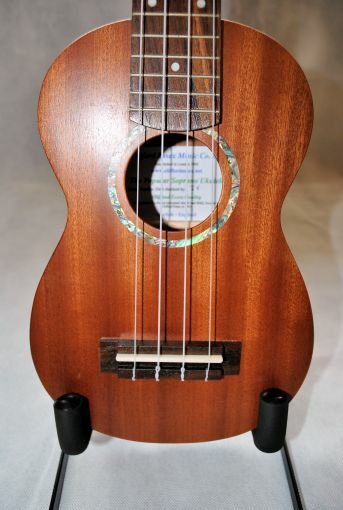 This is quite a striking ukulele; the wooden body, neck and headstock are a beautiful dark brown finish. The construction of the instrument is superb. All joints are solidly constructed and finished to a very high standard which translates to giving the ukulele a very solid feel (in contrast to the bargain basement end of the market from which my own soprano was bought). In the hands, this instrument has a warm and tactile quality from the unpainted, unvarnished wood which makes handling and playing it very pleasant. The subtle, decorative band inlaid around the sound hole which matches in design with the shield/logo on the headstock adds just the right amount of dressing. Having tuned up, I begin to play a few chord runs, C to C7 to F — a usual finish to a song. The ukulele is thankfully free of unseemly buzzes from loose fittings and rattles from the strings on the finger board, — again underlying the quality construction. I repeat the pattern a number of times and am struck by the volume that can be found in the voice of this small instrument. It clearly will not struggle to be heard in an ensemble situation. Strumming over and around the sound hole the tone is bright and full of treble, but as I strum further up the neck the tone becomes mellower and much warmer. Softer strums here allow this mellow sound to complement the softer minor and major seventh chord sequences I’m now playing. The instrument’s voice has changed to suit the mood I’m in, which is a good quality. The tuning holds perfectly well from an initial tuning through my rapid full-handed strums, to single loud strums held for a beat and even into more delicate finger picking. The level of sustain for a single strum is very good, and the instrument doesn’t die off midway through the bar for which I’m holding it. Finger picked arpeggios and individual melody runs are perfectly clear. Even though this is a soprano, adjusting to this instrument takes no real time. There is plenty of space on the fingerboard to form 4 finger chords (C#dim is one I use regularly). When picking the strings I find I can pick them cleanly using two or three fingers without inadvertently striking the wrong string. The action on the ukulele is well set so that it doesn’t feel like I’m strangling it, and I can progress moveable chord shapes up and the down the neck with ease. Barring across all four strings doesn’t require a vice-like grip in order to maintain a good sound. All in all I’m pleased with the way this instrument plays. Would I buy it? The following advice is from GuitarNoise.com wherein David Hodge*, in the article entitled ‘Ukuleles – Separating Instruments from Ornament and Toys’ states: “If you’re serious about picking up the ukulele as a musical instrument, you have to take care to get yourself an instrument that can be played like a musical instrument. You want an instrument that provides you with ease of playing and encourages you to play and practice as often as possible. Your first concern should be how comfortable the ukulele feels. 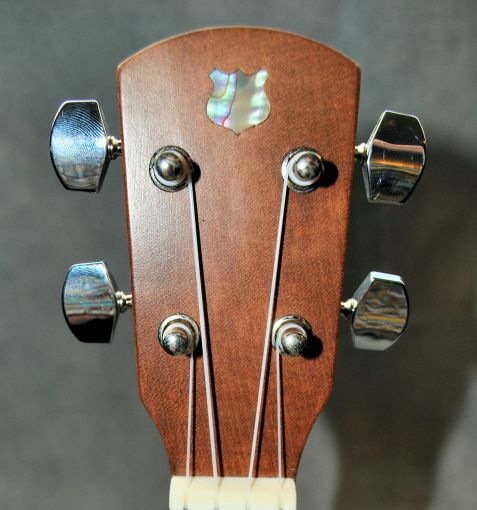 The biggest potential problem area with most ukuleles is the tuners. The last thing you need is to get what you think is a great instrument only to find that you can’t play it for any appreciable length of time because it’s continually going out of tune”. 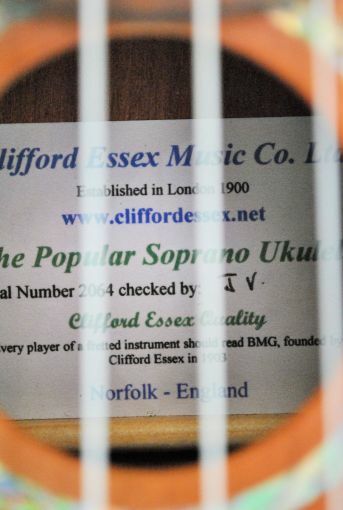 Sound advice indeed and this ukulele from Clifford Essex is indeed a proper instrument. 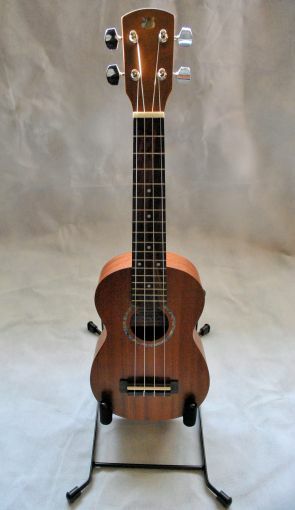 From start to finish playing it has been a real treat and I would highly recommend this soprano ukulele. *David Hodge is Lead Editor and Senior Columnist on GuitarNoise.com and author of the soon to be released ‘Complete Idiots Guide to Playing the Ukulele’.